Questa pagina contiene una breve introduzione a questa grande città. Cerca di descrivere, alle tante persone che vengono da tutto il mondo, quello che proveranno nel visitare questo posto unico. Che viviate qui o che abbiate delle connessioni con Matera, NDN vuole conoscere notizie interessanti ed eventi che si stanno svolgendo in città. Palermo is the capital city of Sicily and is situated on the northwest coast of the island. Sicily is the largest of all the Italian islands and only separated by the narrow Strait of Messina. It has the Mediterranean Sea to the south and the Tyrrhenian Sea to the north, so surrounded by beautiful blue waters. Palermo lies in a basin formed by 3 rivers and several mountains ranges, some of which split the city. The tallest peak is La Pizzuta at 1,333 meters high, but the most famous is Monte Pellegrino, which juts out into the sea and dominates views from the beach front. The mountains cliffs are beautiful and provide fantastic views and from certain positions it looks like a dog lying on the floor, maybe guarding the city? It has a natural port and harbour, which meant it has always been strategically important to the Romans, Normans and Arabs, who all inhabited the island. They all left their own mark on the city, thus it has multi-cultural history, architecture and gastronomy. The port is busy with many types of vessels, including charter yachts by Ionian Breeze and suits first-timers to people with a lot of experience. Crewing a luxury yacht, with professional owners (Eirini and Peter), but also other adventure seeking people too, is amazing for singles, couples or groups will make memories that will last a lifetime. Palermo city center is exciting and yet relaxed, so tourists should use all their 5 senses; sight, smell, hearing, touch and taste, to fully benefit from a visit to this vibrant destination. One of the famous things about the city are the daily street markets; Ballaro, Vucceria and Capo being the biggest three. Everything under the sun is sold there and the markets take on a life of their own. Freshly caught sword fish measuring over 2 meters long, being cut into steaks. Courgettes taller than the people who are selling them. Tables of fruit and vegetables of all colours, shapes and sizes. Delicious street food (Panelle), sending spicy aromas into the air. Clothes and crafts that visitors cannot help but rout through and traders shouting their daily chants of encouragement to buy their goods filling the air! For real Sicilian Confectionary MGM Dolciaria is the company to get them from. Anna and Filippa Milazzo run a 50 year old business that provides an amazing range of locally made products; nought, biscuits, snacks, cakes and much more. There are many famous buildings and outstanding piece of architecture, some of the most popular are; Teatro Massimo Theatre, Palmero Cathedral, Zisa Castle, Palazzo Dei Normanni Palace, and Quattro Canti a baroque square. There are many more and most within a short walking distance of each other. A little hidden gem is the covered Roman ruins near to the cathedral, which most tourists will not find? Religious buildings dominate the city, but some of the best are the lesser known ones; La Martorana, Chiesa San Giuseppe, Chiesa San Gregario Papa and San Domenico, the latter having a beautiful piazza (square) too. When visiting Palermo, the choice of accommodation is vast, from B&B’s to 5 Star hotels. Two great examples are; Splendid Hotel La Torre which is located at the end of Mondello Lido on the sea front and close to the beach. It has great views, outdoor eating areas and swimming pools. Grand Hotel Piazza Borsa, which is an historical building in itself and is located in the city centre, it has great facilities and an unbelievable central ‘old cloister’. It has quality accommodation, restaurant, bar, spa, gym, relaxation areas and also provides top class customer service. 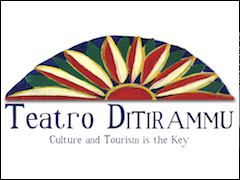 Teatro Ditirammu, is a theatre with a difference, it does not only put on musical shows, with dancing, singing and story-telling, it is also a cultural and craft centre too. It has entertaining area too, where people can enjoy local food and drink also. This family run theatre has a very unique atmosphere, so even when just walking around it, visitors get a feeling of happiness and fun, but once they hear The Donkey, song, they cannot fail to be happier. This a must for one evening when in Palermo, but pre-booking is advised. Vigil D’Arte Cuticchio is a theatre, workshop and type of museum, for the art of puppetry. Before the introduction of TV, Radio and Internet, the most common form of entertainment were puppet (pupi) shows, as they portrayed famous battles, historical event and stories. This artistry was important to the cultural history of the city and thus holds a special place in the hearts of many Sicilians. Near to this theatre is Miniature which is a studio and shop used by Alfie Ferlito. This craftsman creates miniatures of virtually everything, literally fitting the whole contents of a lounge into a match box, a true unique artist, who is known worldwide. Also located in this long, narrow and balcony lined street is a carpenter, gallery, arts and crafts shops, bars and restaurants, all of which make it a unique ‘cultural quarter’ of the city. The mountains that surround the city provide stunning views, but also opportunities for walking, hiking, running and cycling. There is also a variety of flora and forna, wildlife and many tourist attractions! The most important of these being the church designated to Santa Rosalia, the patron saint of the city. The church is a unique and sacred place, built into the side of the mountain and visited by thousands every year. A statue of her stands on the top of that mountain, looking over the city and sea, so she is still protecting her people. The view from there and several other viewing platforms on route are spectacular. Only minutes from the city centre are Mondello & Valdessi, which is the seaside and beach region of Palermo. It is accessed via Vittorio Emananuelle, which a beautiful long tree lined road. Running alongside it is Parque Di La Favorita, which is used by families to play, relax and picnic. There is also a track used by hundreds of joggers on a daily basis. Beautiful white sandy beaches, stunning blue sea, mountainous back- drop, cafes, bars and restaurants makes this destination extremely popular for locals and tourists alike. Add water sports, swimming, sun lounges, great weather and it is the perfect summer resort, especially as it can last from March to November. Palermo’s favorite son is Giovanni Falconi who was the judge who eventually brought down the Mafia. He was assassinated on the 23.05.1992, which is a date of celebration every year to commemorate what he did to (substantially) rid the country of this organisation. On the site of where he was killed (by use of a large roadside bomb), is a large memorial, which can be seen on route to and from the airport. Behind it and a few hundred meters up the mountain, is a white building, which was used to detonate the bomb, which has had the words ‘no mafia’ painted on it. Another and more accessible memorial for him is in San Domenico Church. Sicily is also famous for being the home of Mount Etna, which is located in the east of the country, in the province of Catania. It is the tallest active volcano in Europe, at 3,329 meters high (which varies with summit eruptions). It is a UNESCO World Heritage Site and is one of the main tourist attractions in the country. It is only two and half hours away from Palermo, so a day trip can be easily arranged. Other destinations in Sicily to consider including in a tour of this stunningly interesting country is Castellana Sicula, Mezzojuso, Trapani and Marsala. Palermo is city where you can lose ‘yourself’ in its warmth, history, culture, architecture, religion, cuisine and style. It has many famous tourist attractions, which are great to see, but to get the best from a visit, discover the Sicilian way of life.